Maybe you’ve been an avid bike rider since you were a kid or you have recently taken up cycling for commuting purposes, but bicycling also has numerous health benefits. Unlike other exercise regimens, such as a gym membership that requires monthly membership fees, or specialized exercise programs that require a certain amount of ability or coordination, bicycling is relatively inexpensive and easy. Avid cyclers are not only generally healthier than other commuters, but they are generally more responsible and safe in order to avoid being involved in a cycling accident. During rush hour in a big city, passing by buses and cars full of people, bicycling can be exhilarating and time efficient. Depending on the day, you could easily beat your co-workers to work within an hour! How many hours a day do you spend in your car? Most of your day, outside of work, may be commuting either by car or mass transit. Either way, you most likely don’t find time in your already chaotic schedule to exercise. Instead, you come home, catch up on laundry, e-mails, the kids’ homework, dinner, and straight to bed, only to get up and do it all over again the next day. As commuters, we’re out of shape; we’re exhausted, and tired of doing nothing for ourselves. Here’s when the bicycle comes in handy. Sure, realistically you may not be bike all the way to work, but maybe consider a bike rack, park your car a bit farther from work (maybe in a free lot? ), and bike the rest of the way. If that’s not feasible, why not make your lunch hour a little more exciting? Instead of browsing social media or texting while eating your bag lunch, grab your bike and your lunch and ride to the nearest park. You can exercise, relax, have lunch, and still get back to the office on time. Know what? You might even fight that mid-day slump, too! If a change of pace isn’t reason enough, think about your overall health. Office jobs (or stationary jobs) in particular are damaging to your health. According to a health segment on NPR, office jobs can increase health risks like heart disease and a sedentary lifestyle, overall. If you work in a cubicle all day, think about your lifestyle. Do you move enough? You may spend an hour in the car in the morning (sitting), you come to work and sit at a desk for 8 hours, hop back in your car for another 1, return home to sit on the couch and unwind. Other than a couple of trips to the restroom or printer, you are spending most of the day being sedentary, so really…hop on your bike, already. Heart Health: A healthy heart depends on exercise. If you sit around too much, whether at work or home, your heart is sedentary too. Boost your blood flow, if only for minutes a day! Don’t Ignore the Muscles! : If you sit at a desk all day, your body is losing muscle, not gaining. Additionally, if you have an active or standing job, you need strong muscles to help you stay upright and active. Many workers, sedentary or active, complain of joint conditions, which keep them from exercising on a regular basis. No more excuses! Bicycling is low-impact and more gentle on your body, helping to alleviate (not worsen) and existing conditions. The Waistline of an Office Worker: Not all of us having bulging waistlines, but in the U.S., many Americans have too much of the “spare tire” and it’s often related to sedentary behavior. When you’re sitting at your desk, slouched over and see that extra roll, how do you feel? Thicker waistlines often lead to heart disease, so it’s all connected. Hopping on your bike can burn calories, burn your metabolism, and over time, prevent weight gain. Healthy Breathing: Healthy lung function is essential for a healthy cyclist. Another reason to reconsider riding your bike to work over mass transit? Exposure to traffic exhaust. Bicyclists are less likely to be exposed to long/consistent exposure to traffic exhaust like drivers or mass transit passengers, allowing for overall better lung health. Fight Those Office Germs! : Working an office or a place that requires breathing circulated air, it’s only a matter of time before you get sick during the cold/flu season. Exercise, however, is proven to build up your immunity, so if you are healthy to begin with, you may not catch the same bug as everyone else! Eliminate Stress and a Foul Mood: Did you have a crummy day at the office? Did you almost get into a fender bender on the freeway? Stressed out about deadlines? 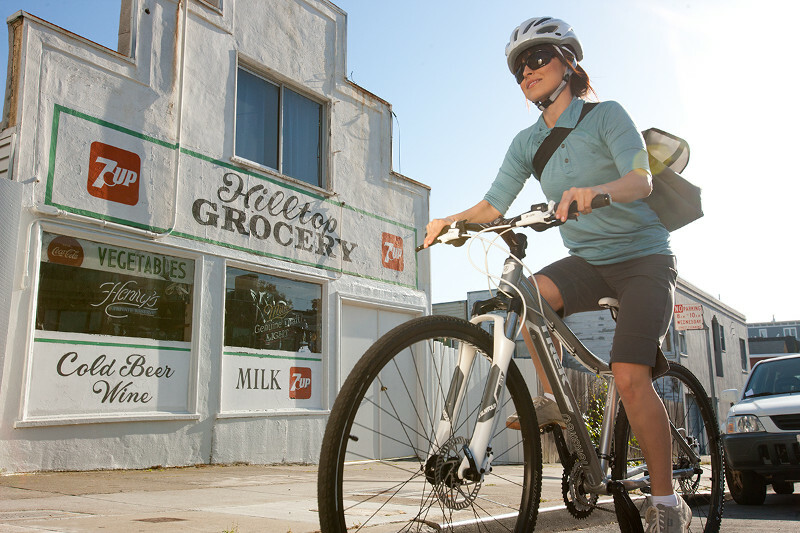 You’d probably rather sit on the couch and “veg out”, but going for a bike ride might make the world of a difference. Exercise makes you happier because your body’s “feel good” endorphins are released, leaving you feeling a lot better (even during stressful times). Stop Being Clumsy: Are you as graceful as a hippopotamus ballerina? Do you trip over things easily or drop things due to a lack of coordination? Bicycling is the perfect exercise to help you with your coordination. Pedaling for a Longer Life: When you are healthy, mentally and physically, you will naturally have the tendency to live longer. Even if you haven’t been a long-time exerciser, it’s never too late to start and bicycling is an easy “beginner’s” exercise. No Distractions: If you drive to work, you may be tempted by multiple distractions, such as cellphone calls, texting, e-mails and even eating. Distracted driving is dangerous when you’re behind the wheel and impossible when riding your bike. If you need to break yourself of a bad distracted driving habit, why not bicycle? Just beware that you should keep a lookout for distracted drivers when you are riding your bike. Better Sleep after a Busy Day: You can’t always control the work-related stress or the piles of work waiting for you when you return the next day. Sometimes all that stress and worry can keep you up at night. According to Stanford University, just 30 minutes of cycling can help insomniacs sleep an extra half hour! Introducing bicycling to your daily routine is a wonderful and easy way to feel better. You don’t need to have the latest and greatest gear to get a good workout, but you should make sure your bike is in good shape and always wear a helmet. Additionally, you’ll want to brush up on bicycle road safety and don’t forget your hand signals! Make sure you are always aware because it cannot be assumed that busy drivers will pay attention to you. Would you rather wait one more day to feel healthier and happier or would you rather get the bike out of the garage, tune it up, and take it for a pedal around the block?